A. With the exception of the Junior Drive Experiences (who need to produce a proof of age), all participants must hold a full, valid driving license with no serious convictions. You must also be able to drive a manual transmission car. If you do not have a licence a voucher can still be purchased and you can be driven around any of our circuits by a qualified professional Instructors/Race Drivers. A. Typically we ask each customer to allow an hour and a half at the venue for a drive in one Supercar and a further 45 minutes per extra Supercar chosen to drive. In the confirmation pack sent out to each driver before an event, it explains how we do require each customer to arrive a minimum of 45 minutes before their drive to allow for registration and safety briefing. It is very important that you arrive at your allotted time promptly as we will be briefing groups of customers every 30 minutes. A. When you get to the venue follow the signage to the car park and the signage to the Registration centre. On arrival at our Registration area we will welcome you and ask to see your driving license. You will be asked to sign an event indemnity form with all your details including address and next of kin details. After registration you will introduce you to our safety and welcoming Instructor for a briefing. On the day we recommend a sighting lap which will typically be in a BMW M3 . The Briefing Instructor will arrange this for you. It will save you “wasting” one of your Supercar drives trying to learn the circuit from scratch. Q. Can I drive more cars on the day? A. Providing we have availability, there is always an opportunity to purchase extra drives on the day but please be aware, to guarantee a drive in a specific car you’ll need to book in advance through this website or call us on 0131 370 0477. If you bring family and friends they can also participate. Please ask a member of staff or visit the sales desk on site. A. 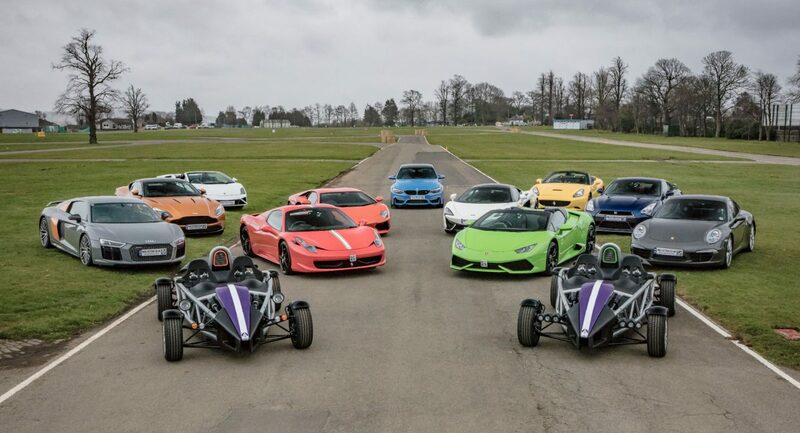 We always bring a wide selection of Supercars to our events. We always have a guest car this can be a Ferrari 458 Spyder or the Lamborghini Huracan Spyder. Hotlaps are also available to participants and their guests in our ariel Atoms, and we also have family drift laps in our BMW M3, awesome fun! Q. Is catering available on the day? Q. Will I receive a driving certificate. A.When you purchase the Media Package it comes attached to the Photo. Q. will I be driving the cars by myself? A. During your time driving with us you will always be accompanied by one of our friendly Instructors who will give advice on driving technique, and guidance on braking, cornering etc. Our Instructors hold s accredited licences such as ARDS and MSA. Q. What about photos and in-car filming? A. Photographs of your driving experience in one of our Supercars will also be available at extra cost. The photograph will be presented in a Ingliston driving Events folder with a certificate. All photos captured are by professional photographer positioned at various parts of the circuit. In-car Filming is a new feature and great to keep for those special moments showing family and friends. You will receive all footage of your drives in all of the cars including any hot laps. Q. What happens if I damage a supercar while driving. A. You are liable for the first £2500 of any damage you cause which is beyond the normal wear and tear to the vehicle. There is an option to purchase Collision Damage Insurance Cover which will insure you against this, however, if the damage is a direct result of your reckless, negligent or deliberate action then you will remain liable for all of the damage to the vehicle regardless of whether you have Collision Damage Insurance Cover or not. The cost of vehicle damage waiver is £30.00 on the day and £25.00 at the point of booking your driving day. All vehicles have in-car footage and can be viewed by the management at any time on the day of your drive as required by our insurers. A. The weather should not affect any of the driving days, but if extreme weather persists (e.g. snow, fog or ice) the day may have to be cancelled for your own safety. You will be given as much notice as possible and will be offered another date. We text and email and will try and call the customer in most cases. Please check for updates via your text and emails. Where we have your mobile number we will call you. Please ensure that you provide us with a correct and current contact telephone number at the time of booking. A. Drivers shorter than 5’0 or taller than 6’6 and/or weighing more than 19 stone may have difficulty being accommodated. A. Comfortable clothing with thin-soled shoes for driving. All safety equipment is provided. The weather is changeable at short notice, so remember to bring warm clothing, a waterproof coat and umbrella. We generally try to provide cover in inclement weather but cannot guarantee this. Disabilities – If you are uncertain please call our office and ask for a manager. We aim to please anyone with a disability. Please try to arrive approximately 45 minutes before your allocated start time for your registration and Health and Safety Briefing. Upon arrival please head straight to the sign-in centre. Please allow 1 hour and 30 minutes for your first car and up to 45 minutes for each car you have booked to drive after that. All times are only an indication and please be prepared to wait for the most popular cars. Please make sure you have your Drivers Licence with you, Gift Voucher and e-mail confirmation (the latter two are not compulsory but recommended). If you are late you may forfeit the right to drive. Catering facilities are available on site; the type can vary depending on venues. We aim to sell quality food. Please note; catering facilities generally only accept cash so bring both with for food and refreshments. You may bring your own food if you wish. Spectators are welcome to attend all events that Ingliston Driving Events directly supply. Due to insurance restrictions, children under the age of 12 are permitted but must be supervised at all times whilst on the site by an accompanying adult. Dogs (except guide dogs) are not permitted, please note it may be possible for spectators to participate in other activities subject to availability on the day for payment of the appropriate fee. At some events pay as you go Supercars, in car filming and photographs are also offered and are subject to availability. Seating is limited and so we recommend to bring a rug or deck chairs to sit on. Pets are not permitted. Guide Dogs Only. Although our aim is always to offer the highest level of service possible, occasionally there may be something that you feel we have overlooked. The easiest way of resolving complaints is to address them on the day. The Management will endeavour to put things right immediately. If your complaint cannot be resolved locally, please inform us in writing by post to our Customer Services Department or by email info@ingliston.co.uk. We are always looking to improve upon the service we offer. If you have any thoughts of improvements, please drop us a line.